So what exactly is a Gabberjabb? When you flip through Walter Hamady’s Gabberjabb No. 6, you encounter a multi-layered, surrealist autobiography that walks a tightrope between sense and nonsense. 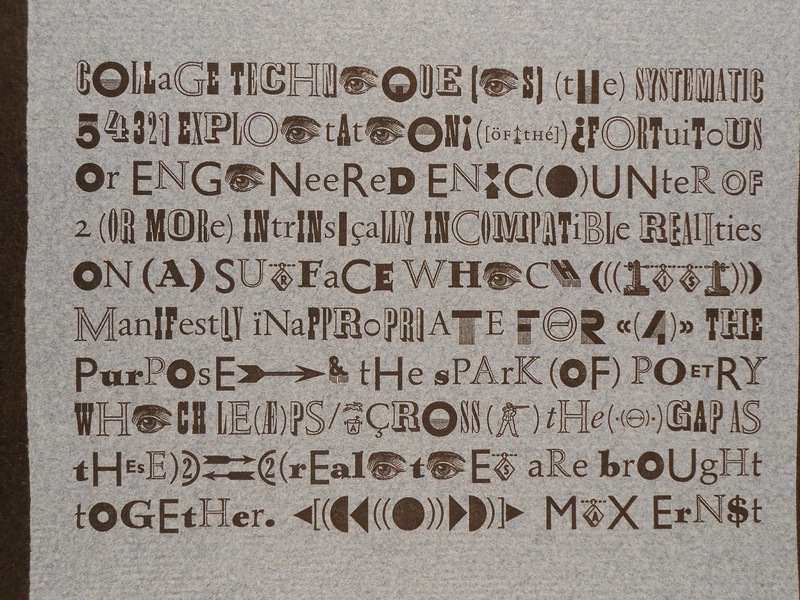 Hamady’s art epitomizes the virtues of letterpress printing and book design while simultaneously poking fun at assumptions about the structure and function of books. In Gabberjabb No. 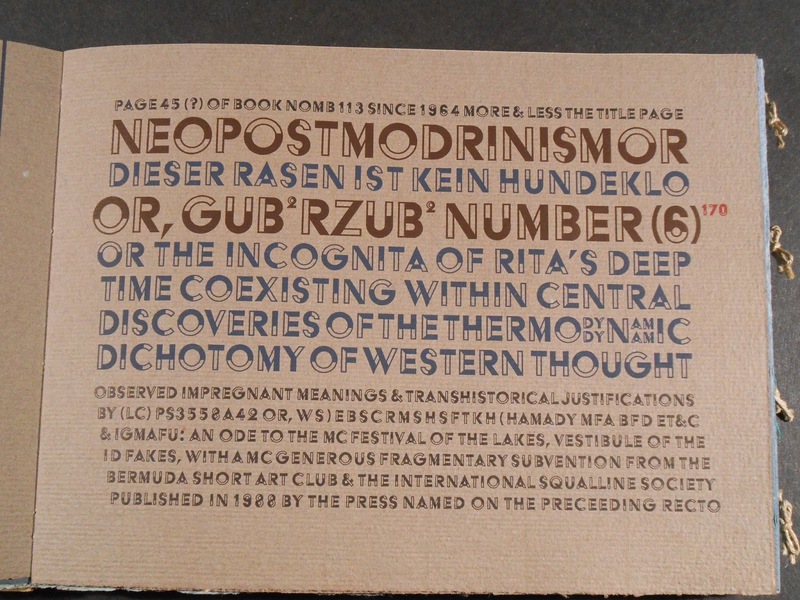 6 (its lengthier official title is Neopostmodrinism or Dieser Rasen ist kein Hundeklo or Gabberjabb Number 6), Hamady seeks to expand the book form by disturbing codified reading conventions and exploring the nuances of typography through continuously footnoted poetry and prose. In Gabberjabb No. 6, Hamady calls attention to the structural elements of book form that are normally taken for granted by readers, such as title pages, indices, footnotes, signatures, margins and gutters, and makes them the centerpiece of the book. 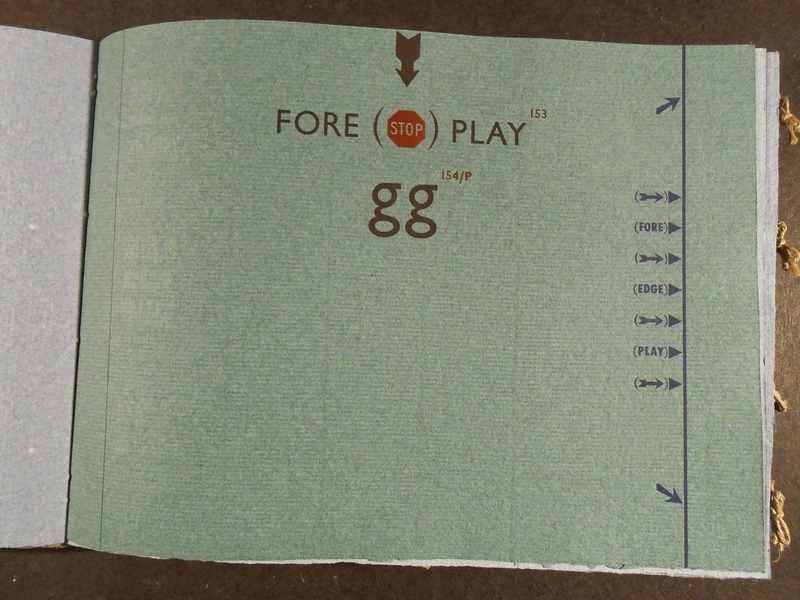 A particularly memorable play on book form in Gabberjabb No. 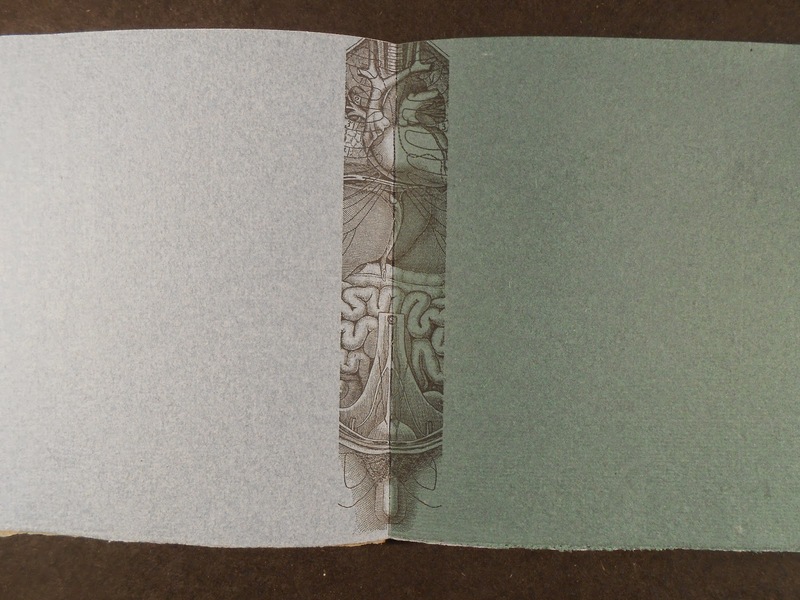 6 consists of a series of page gutters adorned with anatomical drawings of intestines. Hamady draws attention to an empty section of the page that most people never see because of centuries of reading conventions that have conditioned us to focus on the text block in the center of the page and disregard the empty space surrounding it. 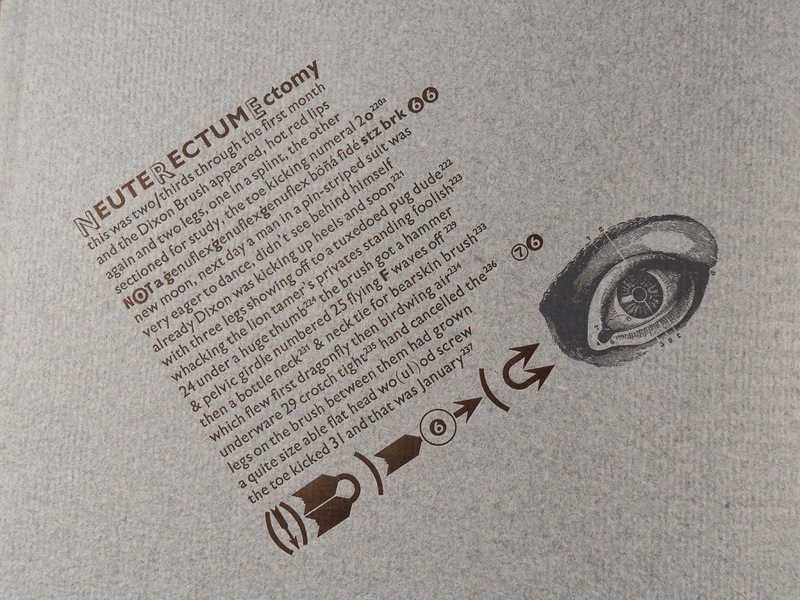 For Hamady, the gutter or “guts” of an open book is the center of the picture plane and should be considered a significant structural element of the book. Through his ingenious and abstract play on book structure, Hamady warns against the kind of reductive reading that focuses on the book’s content at the expense of its form. 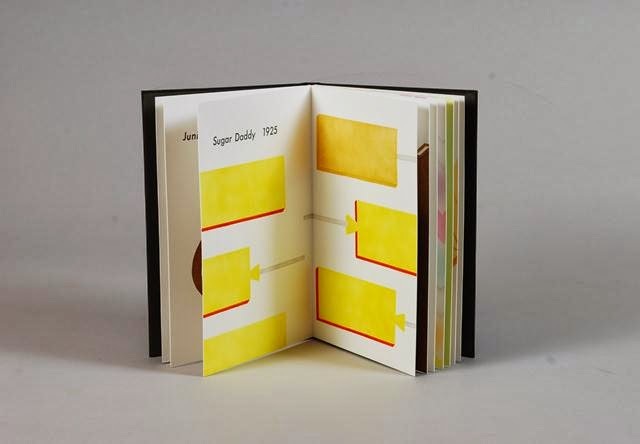 The self-conscious manipulation of standardized rules regulating book form is intended to increase the readers’ awareness that such conventions exist and influence the construction of meaning. In many ways, this book can be considered a meta-critique on conventional understandings of “bookness”; it seeks to challenge our traditional notions of book form by reevaluating how form works in conjunction with content to convey meaning. To see Gabberjabb No. 6, ask for Presses P4187hne. Gabberjabb No. 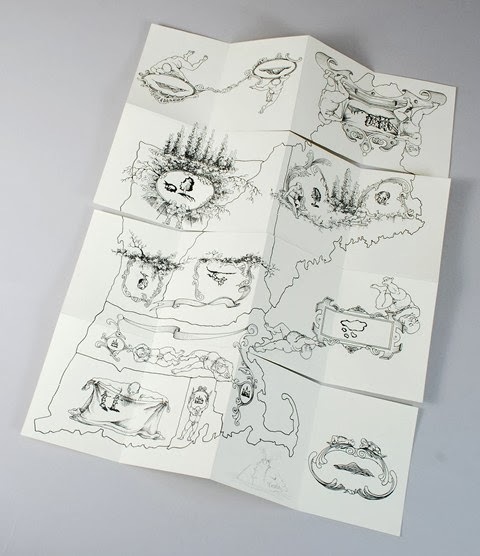 6 is part of an eight volume series called Interminable Gabberjabbs and volumes 5-8 are available at Rauner as well, along with over twenty other artists’ books by Hamady. 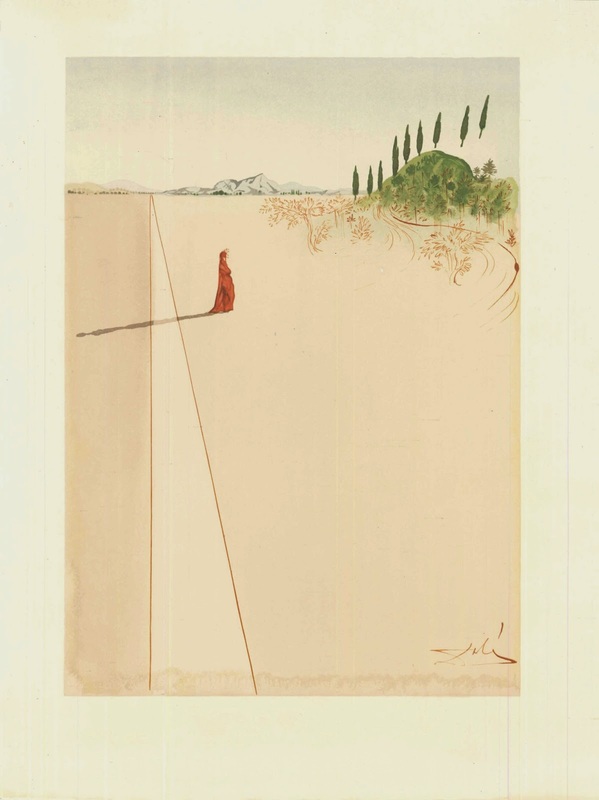 During the 1950s, Salvador Dalí began working on a series of watercolor illustrations to accompany Dante's Divine Comedy. These illustrations, which follow the trajectory of Dante's journey through hell, purgatory and heaven, were commissioned by the Italian government to mark the 700th anniversary of Dante's birth in 1965. But when word got out that a Spaniard instead of an Italian had been recruited to create the artistic tribute to one of Italy's greatest literary legacies, a general public outcry broke out, pressuring the government to revoke the commission. Undeterred, Dalí pushed forward on his own to complete the series, and found enthusiastic support from the French publisher Joseph Forét. 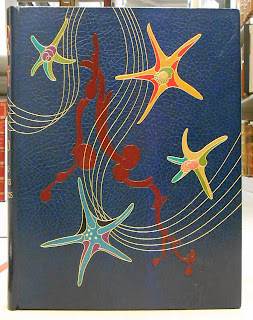 The project was eventually taken up and completed by the French publishing firm Les Heures Claires, which released Dalí’s work in 1965 as a suite of limited edition prints to accompany an exquisitely letter-pressed, six-volume set of Dante’s Divine Comedy. The prints consist of one hundred color woodcuts, which carefully recreate Dalí’s watercolors, capturing their subtle washes of color and delicate linear drawing. It took the woodcut artists over five years to hand-carve 3,500 wooden blocks. Throughout the printing process, anywhere from twenty to as many as thirty-seven separate blocks were needed to reproduce each individual watercolor. Dalí’s illustrations of Dante’s Divine Comedy are far from a literal engagement with the medieval Italian text. 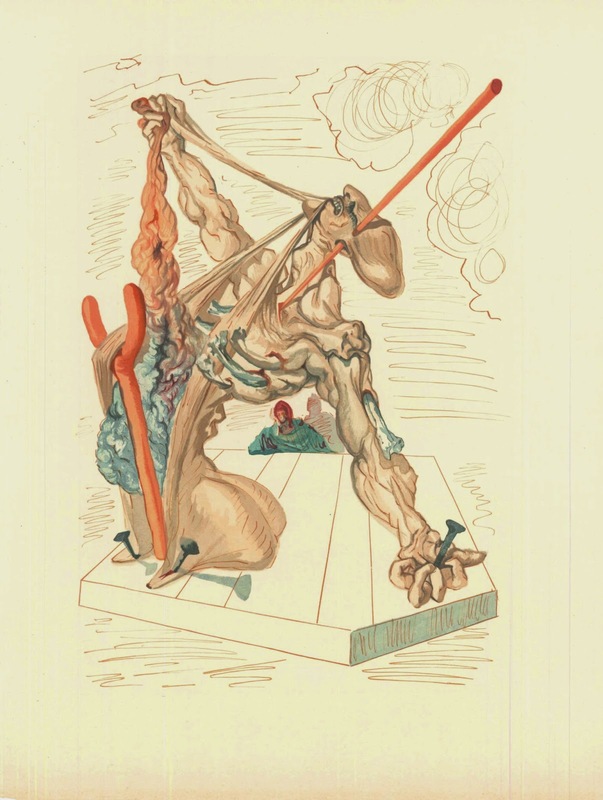 Implementing a psychoanalytic lens, Dalí extracts the metaphoric potential of Dante’s poetry. Dalí’s aesthetic idiom to represent dreams versus reality derives from explorations of the unconscious and subconscious. Most of the Inferno and Purgatorio prints contain motifs referencing the elementary nature of human drives. Dali’s surrealist practice translates man's sins and frailties into unconscious drives. 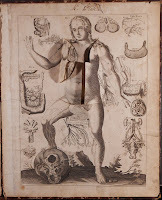 Crutches, bones perforating skin, soft or crystallized bodies, scatological and cannibalistic metamorphoses abound in his interpretation of the medieval text. For instance, Dalí’s interpretation of the twenty-eighth canto in Inferno, "The Hypocrites," plays with the crutch motif, with the naked Caiaphas nailed to the ground. In this print, the crutches indicate social weakness, flaccidity and vulnerability, but most importantly, the evil speeches of hypocrisy. One of the deceitful tongues, which a hypocrite is known to have several of, has been overused and hangs limply over a crutch. Caiaphas grasps desperately at another tongue as he simultaneously clutches his innards spilling from his body. The remaining two tongues are nailed to the floor. 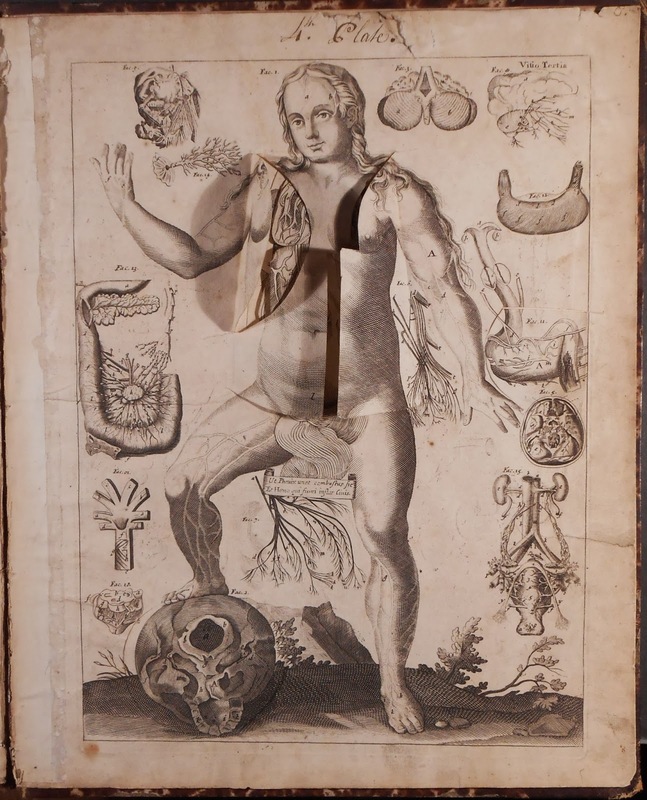 Another illustration that draws heavily from psychoanalysis and surrealism is the print accompanying the first canto in Purgatorio. 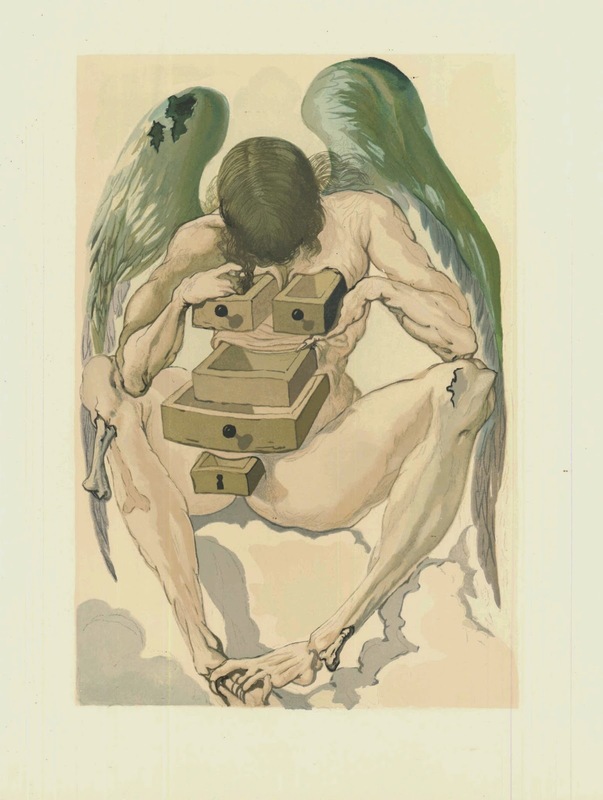 In this print, "The Fallen Angel" examines the drawers of his body. 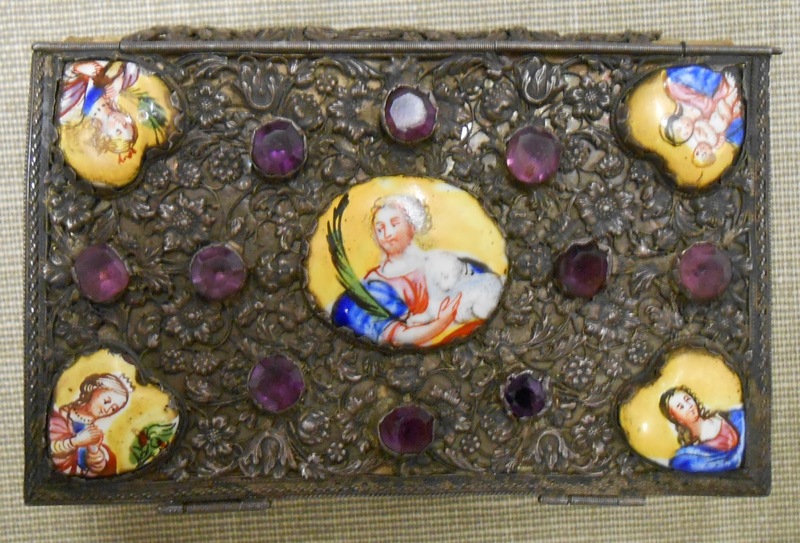 This iconography recalls the famous 1936 Venus de Milo with Drawers. Dalí used this sculpture, as well as the fallen angel illustration, to symbolize the ways in which Freud's analytical tools could be used to scrutinize the human soul. 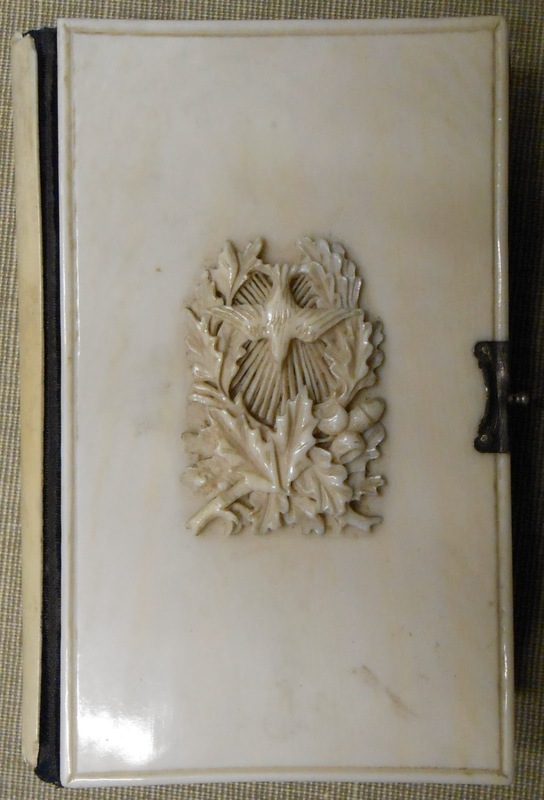 Our copy is currently uncatalogued. 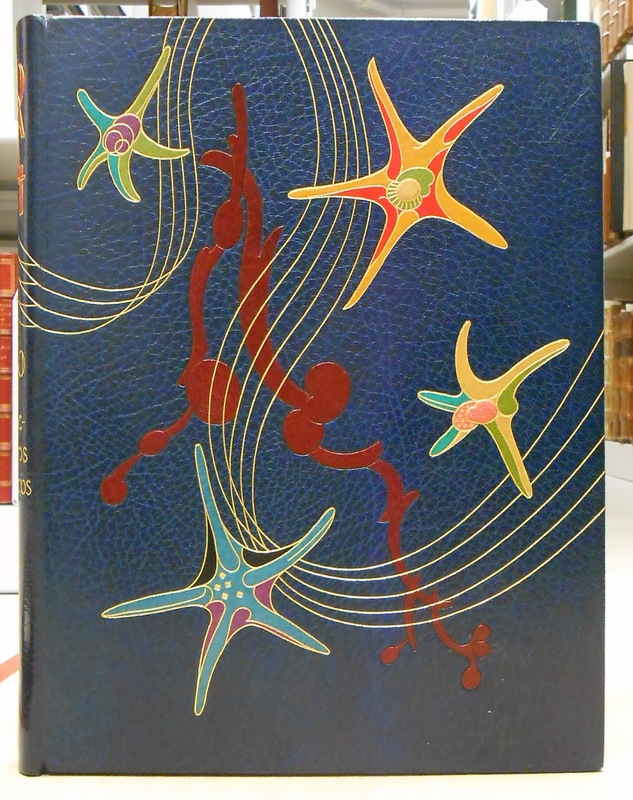 So, to take a look at Dalí's surrealist illustrations of Dante's Divine Comedy, come to Rauner and ask for it by name. It’s exciting as book workers to apply our hand skills and creativity in projects outside of the regular work we do day-to-day. 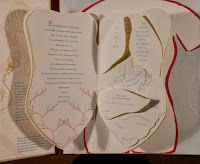 For some of us it means rebinding a book in a more decorative way than usual, for others it is using the entire book form as a means of artistic expression, both inside and out. 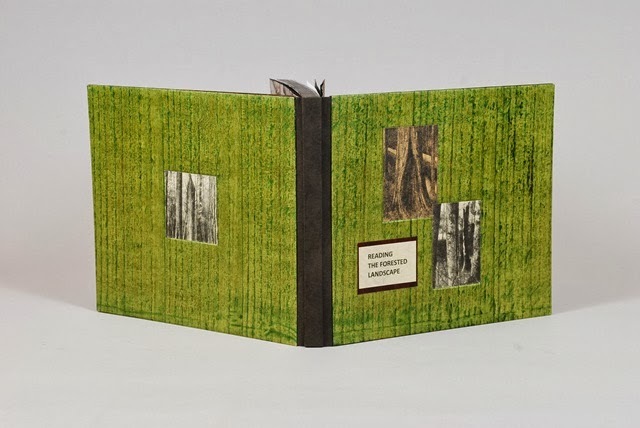 Three members of the Preservation Services staff, Deborah Howe, Sarah Smith, and Stephanie Wolff, exhibit new personal work in the New England Chapter of the Guild of Book Workers exhibition, Geographies: New England Book Work. The exhibition highlights members’ recent work whose content has a New England connection. It opened March 3rd at the Rhode Island School of Design’s Fleet Library. It then travels to The University of Southern Maine, University of Vermont, Williams College, Dartmouth College, and ends at the Creative Arts Workshop in New Haven, CT in the fall of 2015. Its Dartmouth College appearance is slated for April – August of 2015 in the Berry Library. 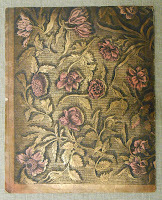 Sarah Smith’s artist book A Map of New England, which Being in Some Places Defective, Shewing Particular Features from the Curious Woodcut Map of John Foster for William Hubbard in 1677: Presented by Percival & Byron and their Favorite Cartouches is a single sheet hand-drawn pen and ink map of New England, which can be read as a book or laid out flat for seeing the bigger picture of the region. Stephanie Wolff’s Sweet New England highlights a selection of confections that originated in the New England region, including the popular commercial treats Sugar Daddy, Necco Wafer, and Charleston Chew, and of course the classic New England sweet: maple sugar candy. 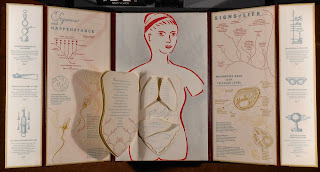 Pages consist of hand-stenciled illustrations and letterpress printed text bound in a drum-leaf style, cloth case binding. In 1934, Aleksandr Rodchenko turned his considerable talent to the production of a commemoration of ten years of Soviet rule of Uzbekistan. The resulting 10 Let Uzbekistan is a monument to Stalinist pride. 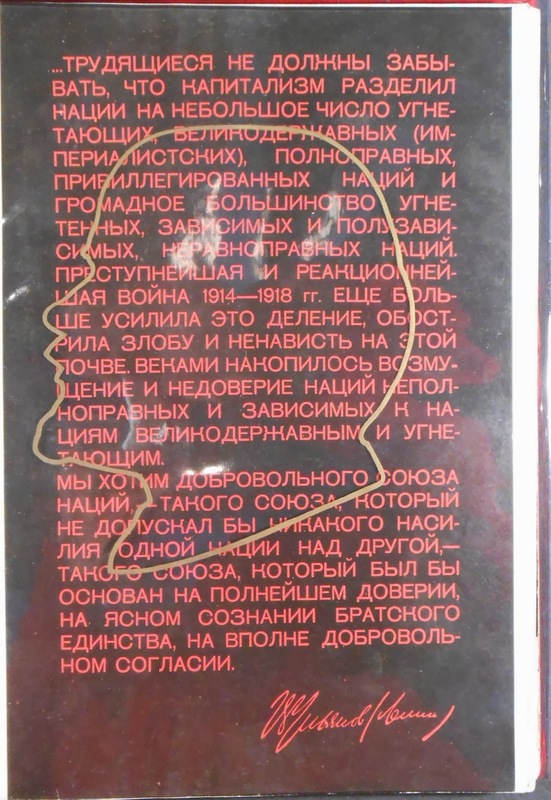 In its original edition, Rodchenko's photographs and designs (including cut outs and acetate overlays) show the prosperity brought on by communism. 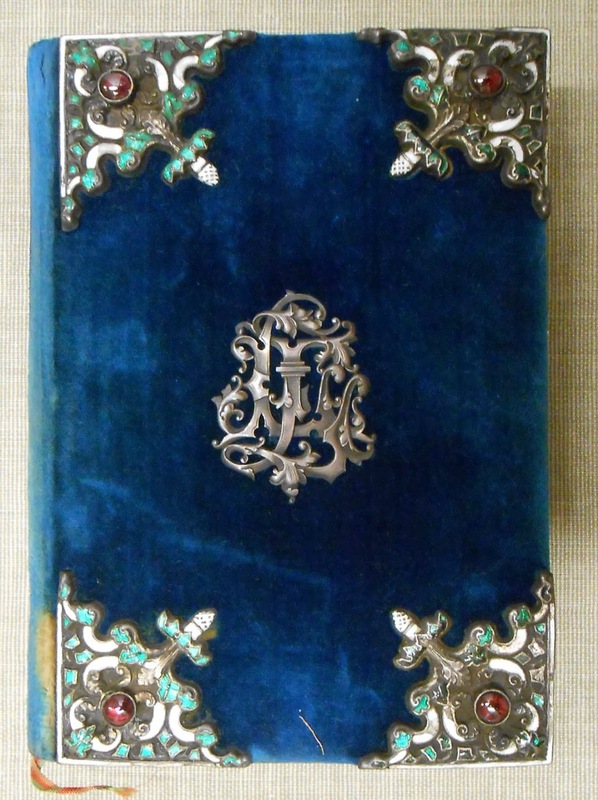 The original edition bulges with images of bureaucrats. 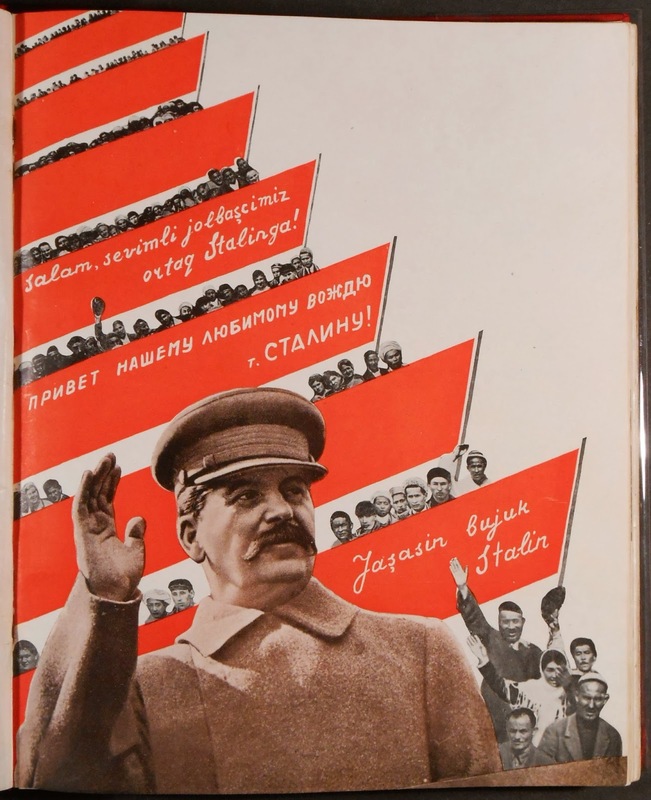 But the book was followed immediately by one of Stalin's purges that reshaped the leadership of the region. Our edition or 10 Let Uzbekistan appears to be a subsequent printing because all of the bureaucrats killed and wiped from history have been cleanly excised. 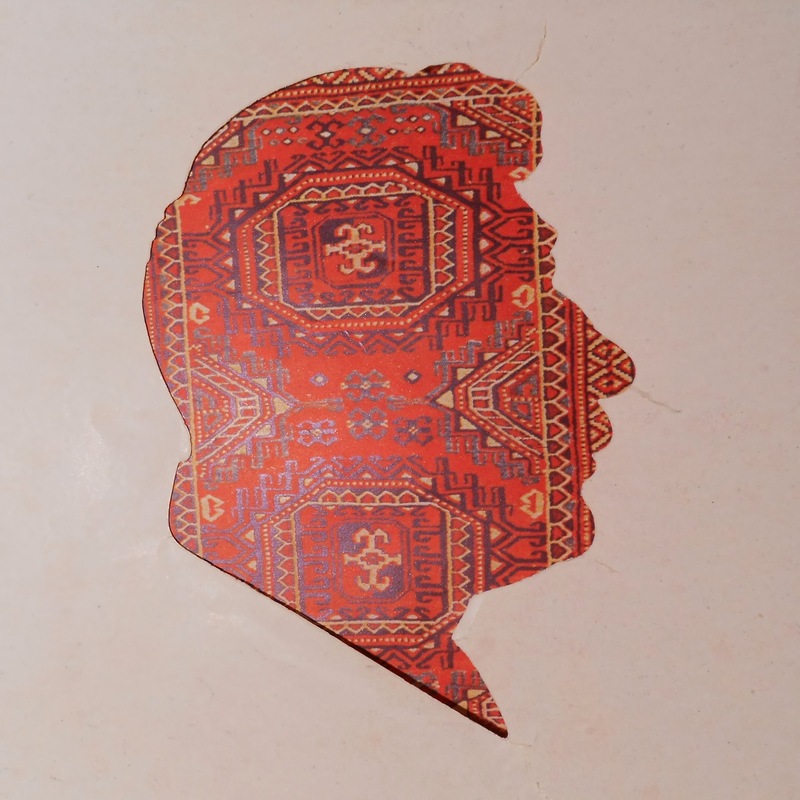 The book is complemented in our collection by Ken Campbell's Ten Years of Uzbekistan: A Commoration (London: Ken Campbell, 1994). 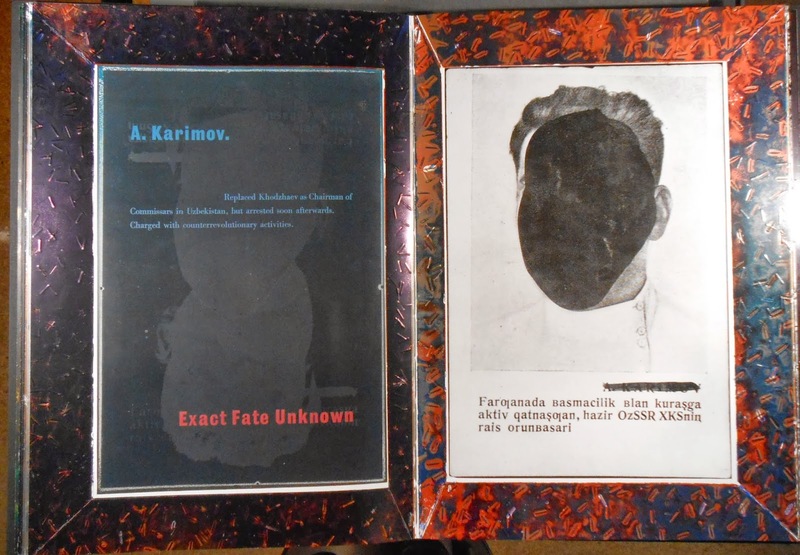 Campbell photographed Rodchenko's personal copy of the original printing in which Rodchenko had blackened out the faces of those purged. Campbell then printed the images with thick layers of ink making them heavy with the weight of history. In his hands the commemoration is not a celebration, but a somber exploration of oppression. You can see them both by asking for Rare DK941.5 .D47 1934 and Presses C155cat. A wonderful example of a flexagon, is found in Vermont artist Carolyn Shattuck’s The quilts of Gee’s Bend, V.2. 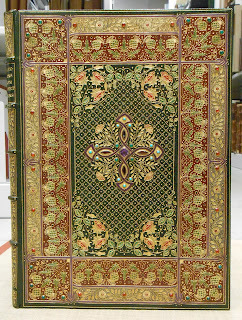 To be more precise, this is a flexagon book, a movable structure made up of 6 tetrahedons. 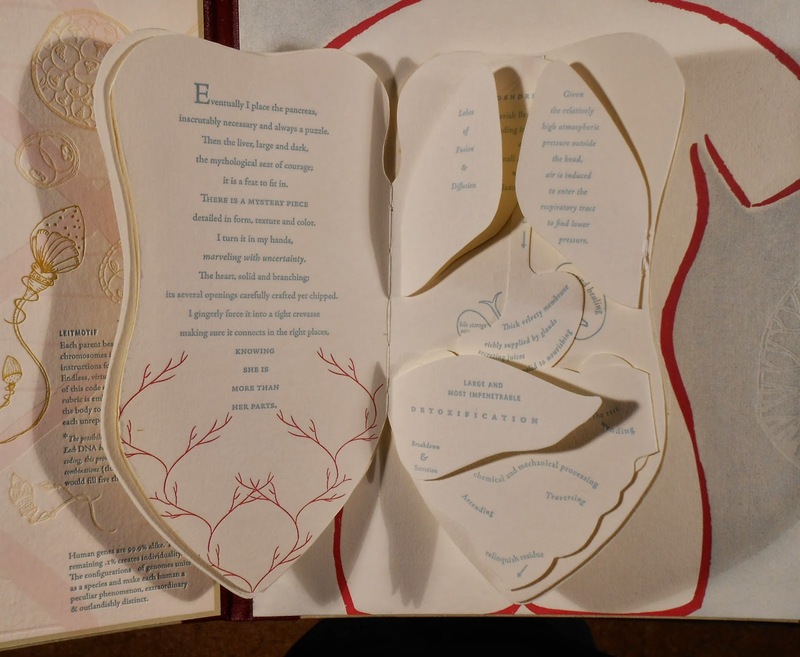 This creates a kinetic structure that allows the user to manipulate and display the book in multiple, unexpected ways. This is the second book Carolyn Shattuck created, that was inspired by the beautiful and unusual patterns found in quilts created in the rural African American community of Gee’s Bend, Alabama. The unknown artists who created the original quilts developed unique designs that are exceptionally vibrant, and this handmade book, #8 in edition of 25, was designed by Shattuck as a tribute to the artists who designed the original quilts. 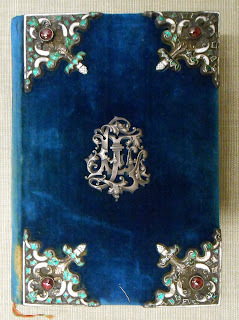 It can be found in the Sherman Art Library Special Collection, call #N7433.4 S417 G34 2011. In high fashion there's often a disconnect between the world of the practical and that of "just because I can." 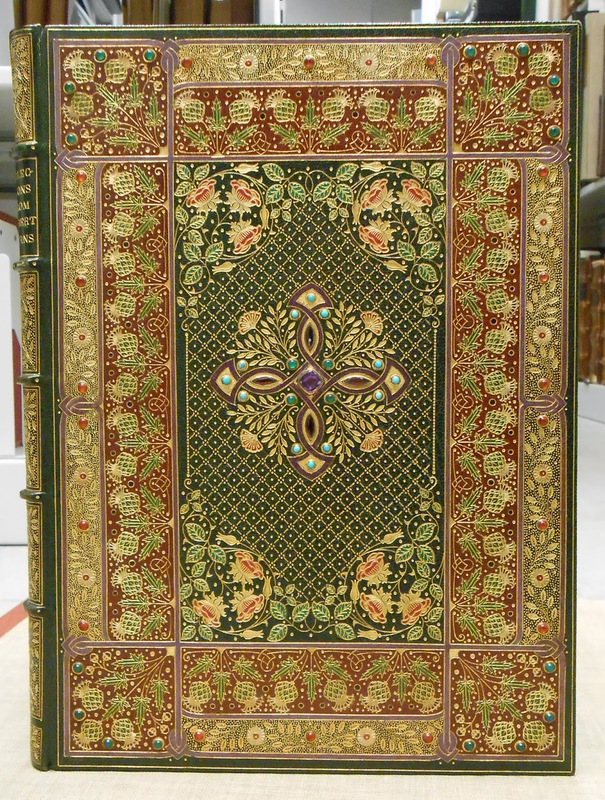 Over-the-top or outlandish designs, often for the sake of the splash of the design itself, also find their way into the world of bookbinding. Sometimes this is deliberate and sometimes it's an honest effort to reflect the nature of the text that just spiraled out of control. 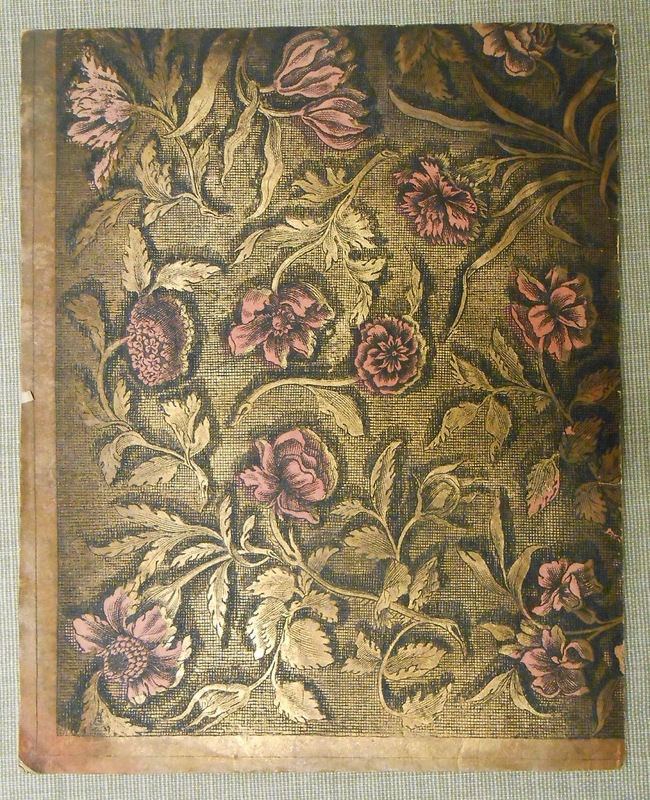 Rauner holds numerous examples of bindings that clearly reflect this decorative dominance and one of our first blogs was about our jewel-bound Rubáiyát of Omar Khayyám. 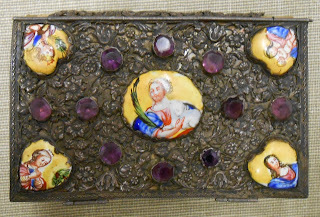 Today's selections incorporate ivory, enamel, wallpaper, velvet, jewels, precious metals, hand-stitching and other materials and techniques intended to enhance the visual appeal of each book and make it stand out from the crowd. 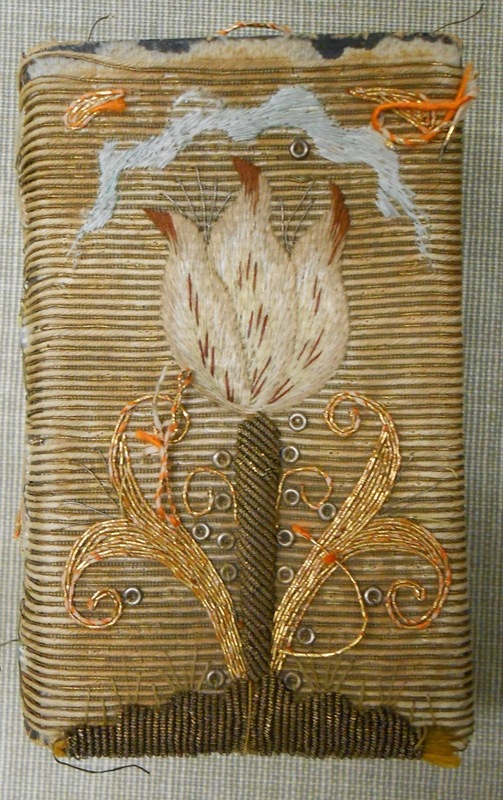 You be the judge of which designs qualify as high fashion for books. Do any of them actually reflect the nature of the text or enhance it? 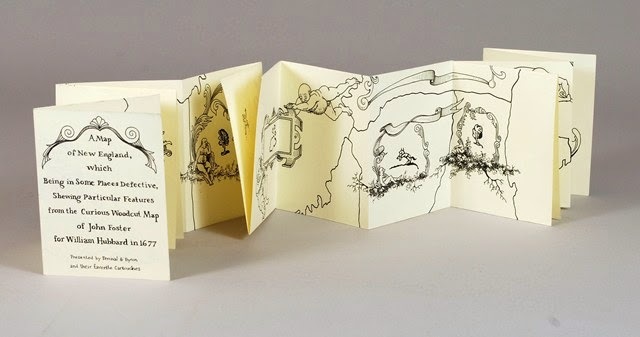 "Nice book"... not really what you think when you see an image of Angela Lorenz's "Cage." But that is because it is not a book. Obviously, it is a serial: volume three of her Light Verse Magazines. This homage to John Cage's 4 Notes in 33 Variations is housed in a vanilla tin with the other four volumes of Magazines. The pins (33, naturally) spell out C A G E (4 letters, naturally). Turn the handle and it sings out a discordant variation for your aural pleasure. 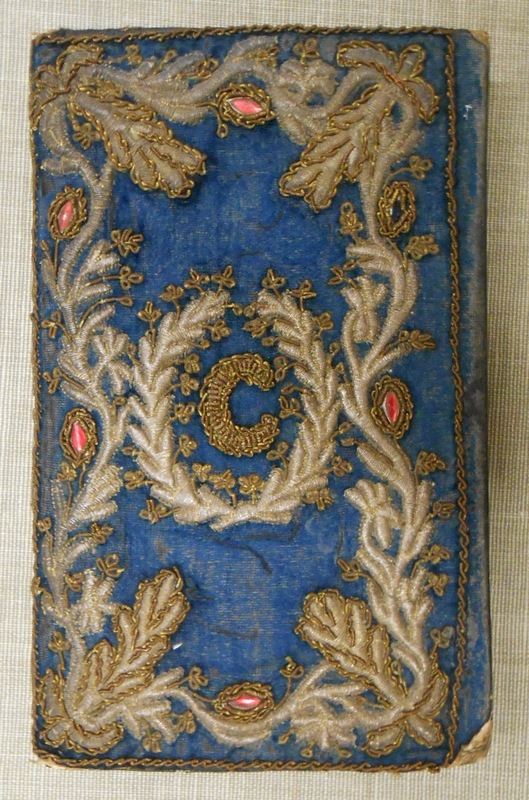 Each volume of Light Verse Magazines is its own elaborate homage to some event or artifact that caught the artist's attention. 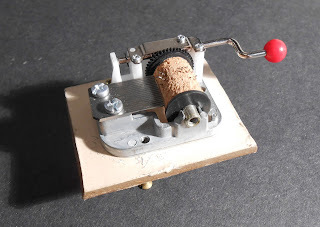 There is a fan that emerges from a fake cigar imprinted with the titles of books read in cigar factories; a poem written on paper folded to look like fossils; another poem printed on paper to form a ginkgo tree leaf in a test tube; and a paper construction of a "Sunday Stone." 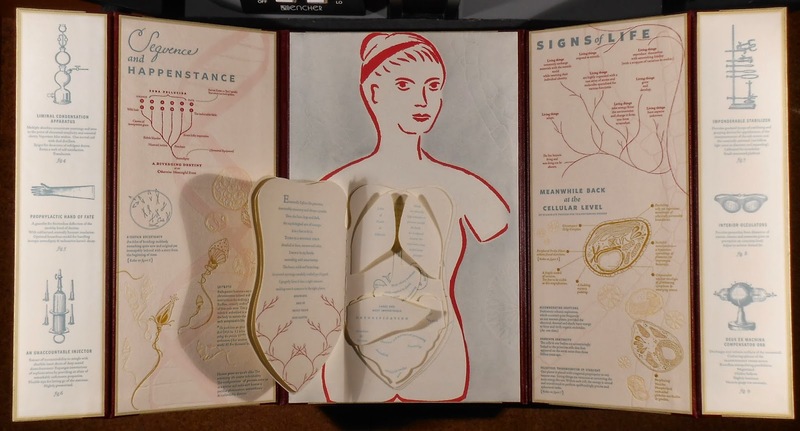 We currently have a small exhibit of some of Angela Lorenz's work (including Binding Ties) to accompany the installation of her Victorious Secret in the Brickway Gallery in Baker-Berry Library. Both will be on display through Fall term. 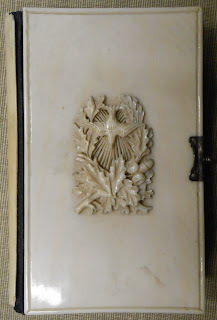 After that, you can see "Cage" and Light Verse Magazines by asking for Presses L867lolig.